They have over 300 whiskeys to choose from so if the BBQ is bad hey there’s whiskey! They have beer. There’s always room for beer. Let’s face it, BOLD Pittsburgh knows what’s hot in the area (again, totally unsolicited). I went down to the Strip after work a few weeks ago and let me tell ya, yinz need to get on this train that Chef Robert Carter is driving because what he’s smoking down there is magic. You have 2 options for dining, sit inside in their elegant dining room by the bar or pull a seat up outside and partake in BBQ experience. I passed on the inside and grabbed the table directly in front of the pit. 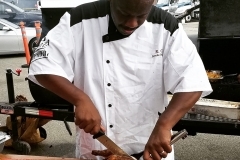 I want to see where the food is cooked and the chef in action every chance I get and Chef Robert did not disappoint. 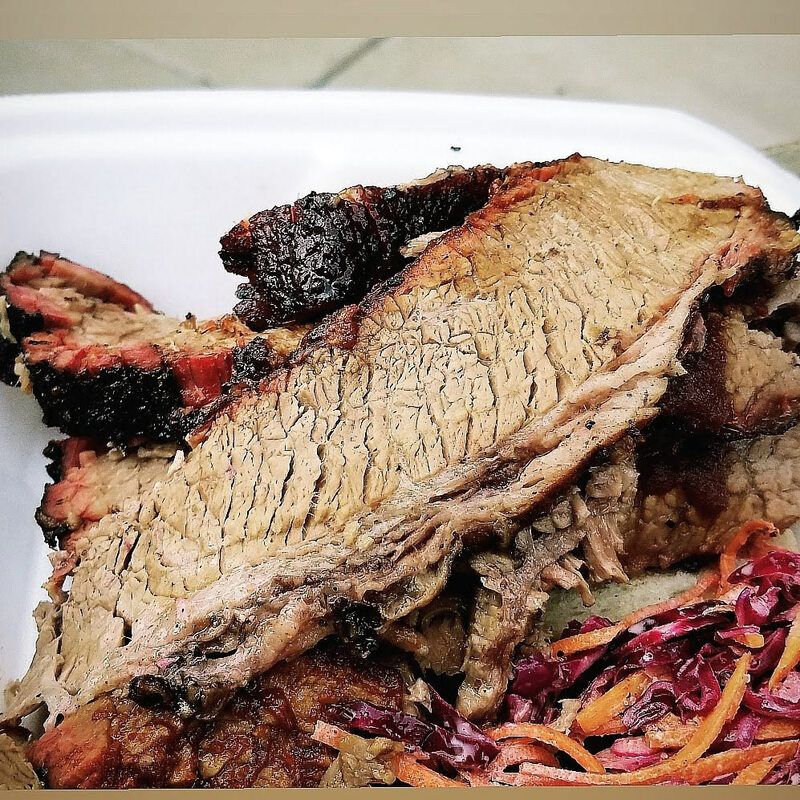 There are 6 events this summer and the menu is posted on Instagram so you know what’s being smoked that day. I need to preface this with my expectations also. When I see BBQ events advertised similar to this I anticipate small portions because BBQ is the “in” thing right now. 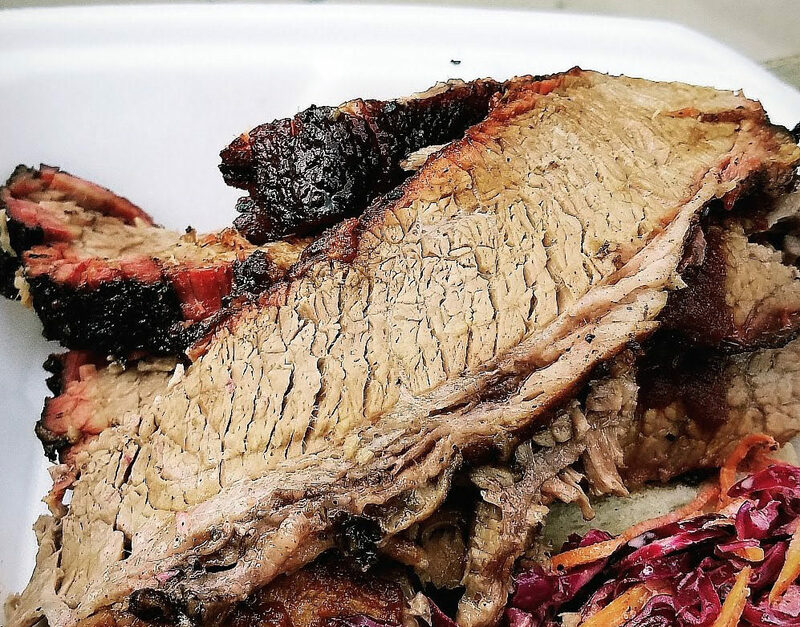 Throw some brisket on a plate and double the cost because “HOORAY! BRISKET! It’s smoked ya know!” or you get 4-6 small rib bones and you’re done with. When I’m in BBQ mode I can put a hurting on meat and drink mostly water all day. I ordered the brisket (2 sides) and 1/2 rack of ribs with 2 sides. The server looked at me stunned and asked “All for you? For here?”. I said, “Yes, I’m ready to eat.”. I was not ready for what was about to happen. 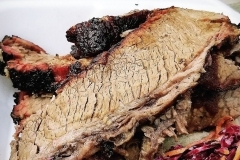 A hearty serving of pleasantly oak smoked, beefy and moist brisket with a slim bark and admirable smoke ring. 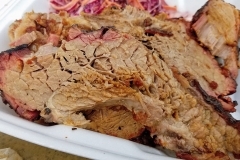 This was the type of brisket I wish I would see more of but I still have another container of food. As R.C. said to me “I didn’t start smoking at 5 AM for people to eat just ribs”. His dedication and precision shows. 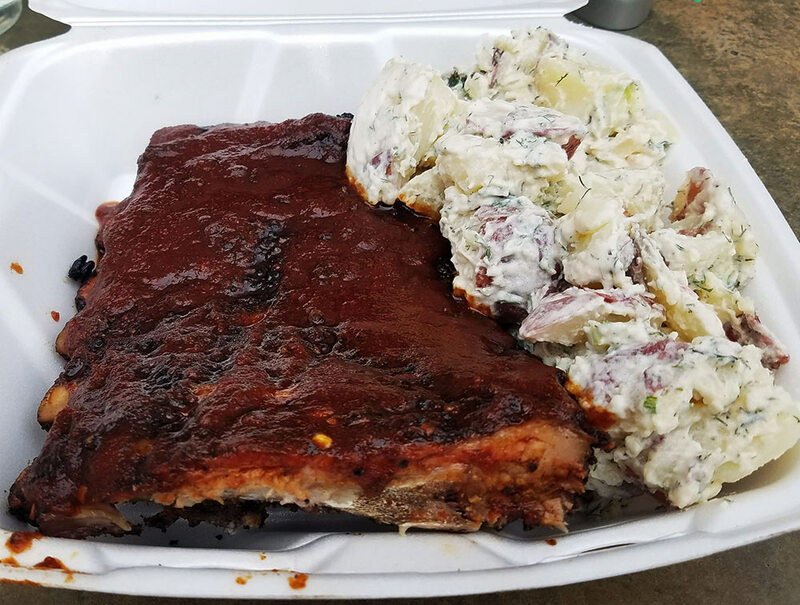 Oh the ribs! You could taste the level of passion he has for BBQ. 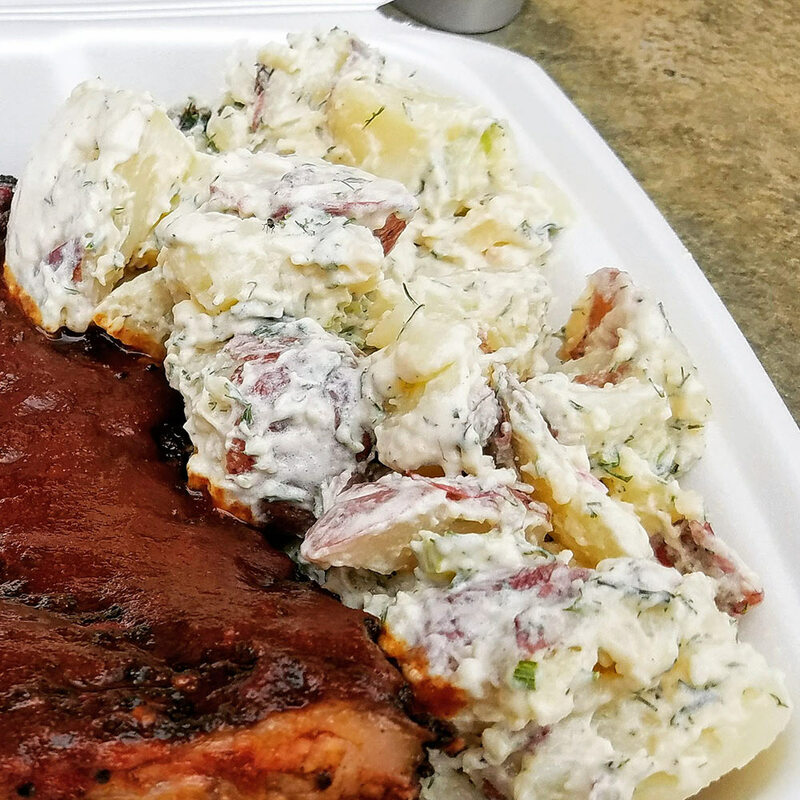 Meaty, smokey and generous cut of ribs will fill you up so choose your side wisely. The meat was tender but not fall off the bone and had a slight tug with each bite. 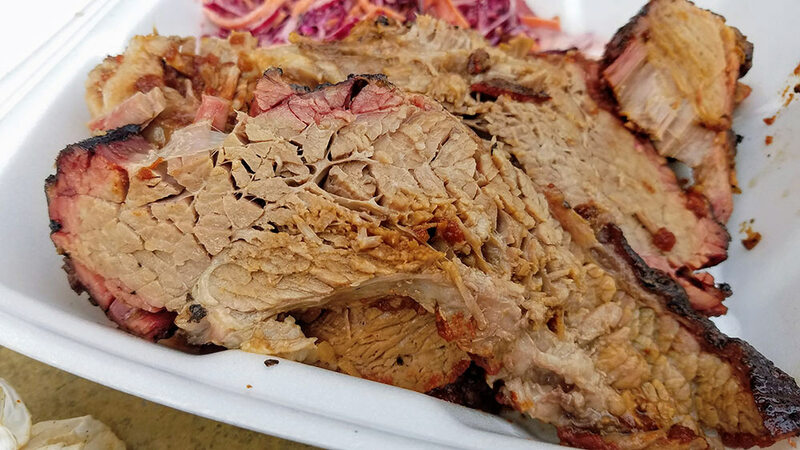 While I think the brisket is king, R.C. 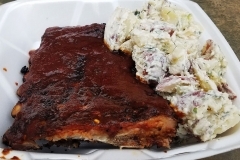 is known for his ribs which made the rack I had the last one. Barbecue gods were obviously helping me out with that one. Sides usually make me grumble as I search out dishes that show more effort than the tired container from a deli. 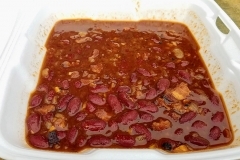 The beans were booming with flavor (and BACON). 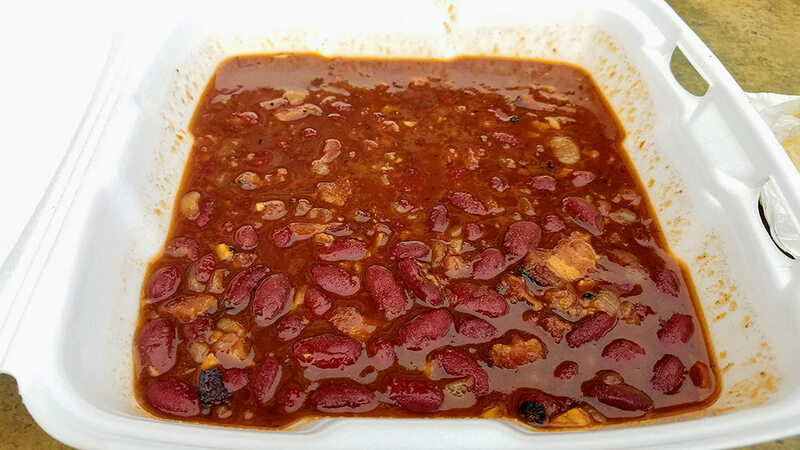 Since I had 2 orders of beans they came in one large container. I suggest you go that route so it doesn’t mix with your BBQ. The cole slaw was chilled and packed with a vinegar bite which was not my favorite but better than most. 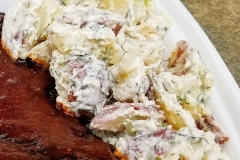 *loving sigh* the potato salad. This is deserving of special attention. People, this is how you make a side of potato salad. THIS. RIGHT. HERE. Light cream red potatoes. 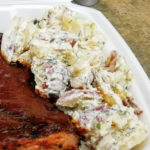 The picture doesn’t do it justice but it is, in my opinion, the best potato side I’ve had in Pittsburgh BBQ thus far. Fight me on it. I ended up going home with a full container of leftovers. Seriously, don’t do what I did unless you want a meat coma or you have a sibling waiting for you with beer (like I did). I do have a few suggestions for the remaining events. 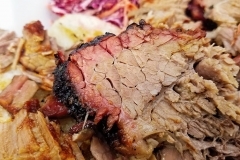 Paper towels/napkins: This is BBQ. It’s messy and not fine dining. I did get a napkin for my table but you need to throw the fancy away and have more paper towels/napkins available. Inside? OK that’s more upscale but outside have a roll at every table. It’s OK. It’s barbecue. Have suggestions to pair the BBQ with beers/whiskeys/mixed drinks. RC’s BBQ is great by itself but if you say there’s an Old Fashioned with my name on it you can bet I’m ordering 1… or 3. As you can see that was a lot of barbecue I ordered. Even better if it’s from the neighbors Wigle Whiskey or Maggie’s Farm (collab time!). In fact make it a full experience, BBQ – Dessert – Cigar. You could pair wines but I’ll leave that to Steve from BOLD Pittsburgh. Music. I don’t recall any music playing outside but something is better than the tapping of people on their phones. 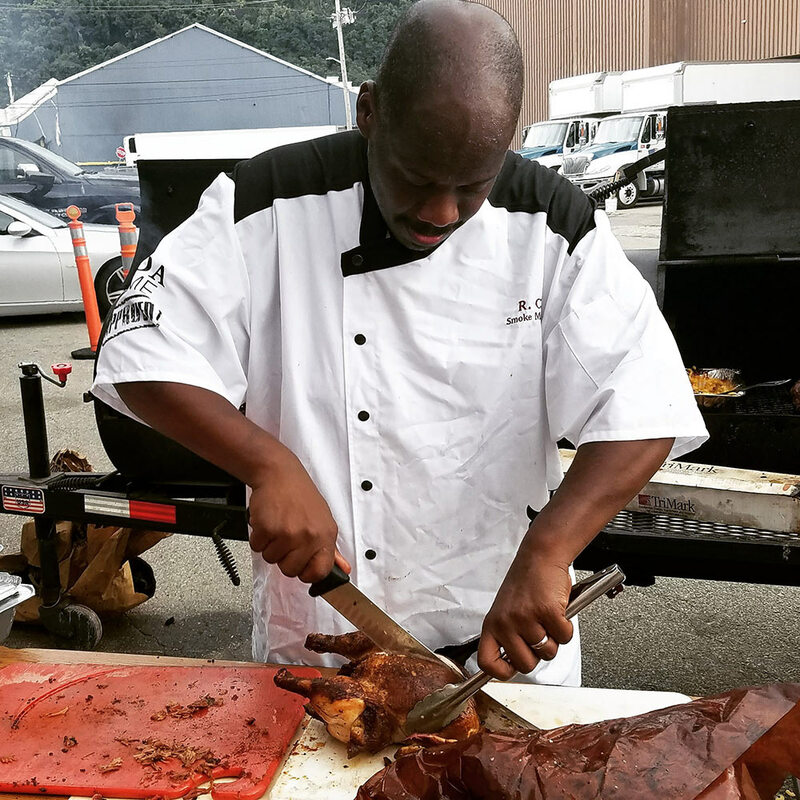 There are 2 remaining events (August 10 & 24) and I suggest you get there before 6 pm if you want the full experience because he’s one man with a smoker. When he’s out, he’s out. **UPDATE** They have added 2 more dates! You can also sauce up your life with BBQ on 9/14 and 9/28! I have pics on Instagram Stories. 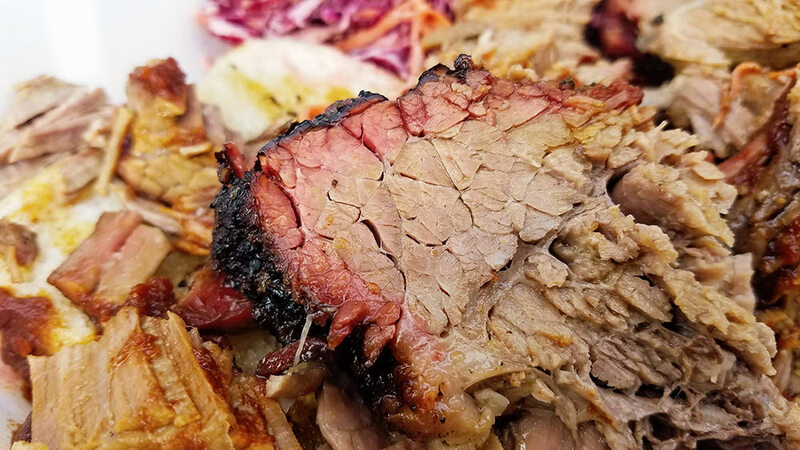 Make sure you follow Yinz Love BBQ Instagram and also keep up with Cioppino’s feed. You won’t be disappointed.